Who says entrepreneurs have to start young? These owners waited until their 60s, 70s or even 80s to first launch a business. 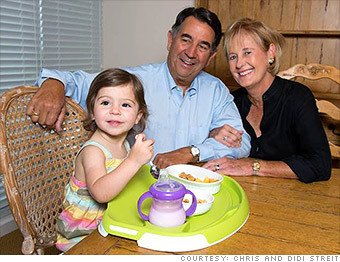 Chris and Didi Streit with their grandniece Eloise testing the Tidy Table Tray. Chris and Didi Streit didn't expect to become entrepreneurs after retiring. But then their daughter Megan invented the Tidy Table Tray -- an attachable tray designed to make it easier for young kids to eat at the dining table. Megan invited her parents to go into business with her, given Chris's background in business and finance and Didi's experience as a nursery school teacher. The transition to business owner was easy for Chris, but Didi faced a learning curve. "I definitely had to improve my computer skills," she said. The Streits are delighted to have a family business that lets them spend more time with their daughter and granddaughter. But there are also some sacrifices. "We love that we're keeping our brains working but we have lost some of our down time," said Didi. But, she added: "I don't regret it. I'm loving every minute of it."